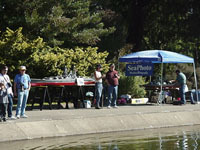 A few views from a most enjoyable 2 day regatta held at the Flycasting Ponds, Golden Gate Park. See you there in 2001! The scene at the Flycasting Ponds - an excellent place to run, albeit once a year. Some more views of this fine model. Kevin has said he has even more detail to add before he completes this project. Here we get a chance to practice some of our formation running. I still have to do a bit of touch up on the side of my DDG - I definitely need to practice more! Of course, Ryan showed up with his Sprucan. Still need those bridge windows buddy! Hanger doors looking good though! And then go tearing off across the pond on a speed run. With so many models, things can get a bit crowded sometimes. Finally, I show that it is indeed possible to pick up girls with working model warships. In this case, John Anderson's HMS Hood.